DIVISION 1 – In the first semi-final Appleby lined up against a Genesis Five Nations team that had been unbeaten all season and were odds-on favourites to win the Division 1 title. As the teams faced off it may not have been “Mission Impossible” for Appleby but it certainly looked like “Mission Extremely Difficult”. At the end of an even first half the scores were tied at 2-2. Then the heavens opened and, after an extendeddelay, the second half belonged to the Apples’. Three unanswered tries gave them a stunning 5-2 win. The mighty Five Nations had been toppled. On the day it was nothing more than Appleby deserved. Fast and clinical in moving the ball up field, they asked questions that the Five Nations defence could not answer. They simply played the conditions better. Ever gracious in defeat though, Five Nations can reflect back on a highly successful season. In the second semi-final, Maples1 took on PWC. Maples1 had stumbled through their last three games of the season and questions were being asked as to whether they were a spent force. But I think it was Confucius who once said “When the going gets tough, the tough get going,” (or was it Billy Ocean?) and so it was in this match. The electricity in the clouds matched the voltage on the pitch. It was frenetic. It was fractious. It was frisky. It was a display of clinical finishing and excellent defence that saw Maples1 win 6-1 with three tries a-piece for returning captain Marty Livingston and Jyoti Choi. And so, the Division 1 Final pitched last year’s Champions Maples1 against Appleby. Although the rain had stopped the pitched presented a lot of surface water and it was a hard slog to get any kind of running rugby on show. Early scores in a one-off game are vital and Marty Livingston provided just that with an incisive break from just inside the Appleby half to touch down with a dive that Greg Louganis would have been proud of. Further first half tries by Jyoti Choi, Mark Fagan, and Emily Davies stretched the Maples1 lead. Appleby weren’t going to give up without a fight and before you could say “Simon Raftopoulos” they had scored two of their own. The crowd became increasingly vocal and when Michelle Bailey got another for Appleby to make it 3-5 they dared to dream of a dramatic comeback. However, Maples1 have been champions for the last two years for a reason – an ability to apply pressure, take their chances and protect a lead with great defence – technically three reasons I admit but you get the point. And so, in the face of a resurgent Appleby’s team, Maples1 increased their lead with three more tries to register a great 8-3 victory, Jyoti Choi getting MVP with a personal haul of four tries. MAPLES 1 – Division 1 Champions. DIVISION 2 CHAMPIONSHIP – As the rains fell to submerge the earth and thunderbolts crashed in the distance, it was as if Poseidon and Zeus themselves had taken front row seats to see the Trident Titans take on Happyfish Ticklers in the opening Division 2 semi-final. The Titans gratefully accepted this divine intervention and recorded an emphatic 10-0 victory. Brad Stephenson (3) and James Waters (3) were particularly pleasing to the watching deities. KPMG1 played Maples2 in the second semi-final. They had beaten them twice before and were confident of a repeat performance in this game. However, Maples2 raised their game and gave KPMG1 a real fright. Marc Randall and Rebecca Palmer answered tries from KPMG’s Ben Blair and JS De Jager making the scores tied at 2-2 at the final whistle. In touch rugby tied games are decided by a system known as “The Drop-Off” where players are removed from the game at one-minute intervals until someone scores. The first score wins – Sudden Death! As players were removed the gaps increased and eventually, with just four players on each side, Gerhard Albertyn made the decisive break to score and put KPMG1 in the final. And what a Final it was. Division 2 has been the most exciting division this year and the Final didn’t disappoint. Two teams, Trident Titans and KPMG1 went at it hammer and tongs. No quarter asked, none given. As the score fluctuated the increasingly exuberant crowd was treated to some scintillating rugby. The skills and handling on display made a mockery of the treacherous conditions and neither defence could get to grips, quite literally, with the opposition offence. The Titans had a try threat all over their team and James Waters (3), Lisa Bird (2), Riley Mullen (2) and Ashley Puschman (1) all registered scores. Interspersed between these were tries for KPMG1 by Neil Montgomery (2), Michael Sumares (2), JS De Jager (1), Phillip Fourie (1) and Ben Blair (1). Add them up and you get a final score of 8-7, the Trident Titans coming out on top. At the end, both teams looked exhausted knowing that they had put everything into the game, a great game to end a great Division 2 season. TRIDENT TITANS – Division 2 Champions. The Division 3 play-offs were the first games of the days and as such preceded the rains. Deloitte beat Rawlinson & Hunter 5-3 in the first semi-final. RileyMullen, Deloitte’s top scorers this season chipped in with a smartly taken hat-trick and the result, despite Rawlinson’s best efforts, never looked in doubt. In the second semi-final Credit Suisse took on a KPMG2 side which had beaten them twice in the regular season, but Suisse went into the game equally confident having been the only team to beat league winners Deloitte all season. Not surprisingly, the game was very tight and in spite of tries by Martin Steyn, Dave O’Driscoll, and Neil Montgomery for KPMG2, Dave Bailey masterminded a 4-3 victory for Credit-Suisse in overtime. The Final pitched Credit Suisse against Deloitte. Suisse were hoping that lightning would indeed strike twice and that they would beat Deloitte for the second time in two weeks. Deloitte were equally determined to avenge their only defeat of the season. The Suissers were without their talisman from last week’s match Ben MacDonald, and in an intriguing game they never really looked like troubling Deloitte who eventually ran out 9-4 winners. Riley Mullen finished off a great day for him personally with a five-try haul, Dean Curtis (3) and Neal Ainscow (1) adding the extras. DELOITTE – Division 3 Champions. As the day came to a close trophies and beers were handed out to the champions, a fitting reward for another great season of touch rugby. Later in the week the players attended the end of season dinner where they paid tribute to the individuals whose performances stood out during the season. Thanks must go to Jacques Scott, Six Senses Eco Tours, Cayman Islands Rugby Club, Cayman Distributors, Fat Fish Adventures, Kirk Freeport, Happyfish, Agua Restaurant & Lounge, and The Reef Resort for donating wonderful prizes and, in particular, to Travel Pros who provided an amazing prize of a flight and three-night stay at Pico Bonito, Honduras with a rafting trip, lunch and massage at The Yoga Retreat. The lucky winner was James Grant of Ernst & Young. 1549 tries were scored over the entire season. 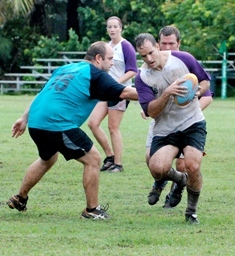 349 games of touch rugby were played this summer. 242 different players crossed the white line to score a try. 31 times Neal Ainscow scored for DART making him the highest try scorer over all three Divisions. I think he dived for 94.6% of them! 6 tries was the most scored by one player in a game. Stuart Geddes of Appleby did it twice, against Ogier and DMS. 27 tries were conceded by Genesis Five Nations during the regular season making them the meanest defence in the league. 14 times Michelle Bailey of Credit-Suisse scored, making her the highest scoring female player. 3.6 seconds was all it took for Etienne Duvenage of PWC to run around the entire Maples1 defence to score the fastest try of the . 453,285 touches were made during the whole season (more or less). 1 middle-aged man celebrated his first ever try in rugby by pulling his shirt over his head and jumping up and down like a schoolboy. Nice one fella! *Some of these figures have not been audited by an independent third party and may be entirely bogus. Great write up. This guy clearly has talent! Put him on the payroll.